Best Astaxanthin featuring BioAstinÂ® supplies natural astaxanthin, an exceptionally valuable carotenoid nutrient, along with other naturally occurring carotenoids. 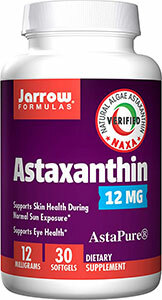 Astaxanthin is an ultra-potent antioxidant with unique effects on cell membranes that manage important life functions. This action is linked to clinically proven benefits for the circulation and for vision, immunity, and overall well-being. Versatile cell membrane and whole-body protectant (including brain and eyes). • Orders may be placed via regular mail. Click here for order form. Print this form and mail it with payment to our business mailing address.